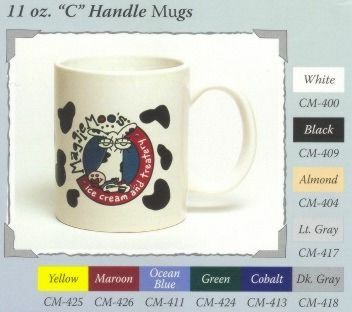 Custom Imprinted Ceramic Coffee Mugs, Customized, Printed, Personalized, advertising. Custom Imprinted Ceramic Coffee Mugs - 11 Oz. Price Includes One Color Imprint. NOTE: All prices, quantities, sizes, brand name, and/ or colors are subject to change without notice. Requirements to prepare and/ or to e-mail artwork to us, click here. Set- up (screen) charge): Add $50.00 per color - per design. Imprint Area: 2½ H x 3" W x 7½" wrap. For additional imprint colors, see price chart. • Here's a great opportunity to identify with the winner in your community. • Bright, bold imprinted messages help promote team spirit for businesses, schools and booster groups. • Bright white colors works with any imprint. Imprint Colors: Black, White, Red, Royal Blue, Navy Blue, Baby Blue, Green, Orange, Yellow, Purple, Brown, Gold, Silver, Maroon. Additional Color Imprint: Add set-up charge per color per design, plus the additional color imprint charge, shown in the price chart above. Second Side Imprint: Add set-up charge per color per design, plus the additional color imprint charge, shown in the price chart above. Ink Color Match (PMS Pantone): $45.00 per color. Exact color match can not be guaranteed. Your Custom Logo or Artwork: Please provide black and white camera ready ( or color separated, if more than one color) artwork to size (see "imprint area" to size the artwork).. If you need artwork preparation, connect to the following link: Requirements to prepare and/ or to e-mail artwork to us, click here. Packaging and Weight: Bulk, approximate 37 LBS./ 36 mugs. Shipping: FOB factory or warehouse. We will use our discretion as to the best method to be used. Please call us for approximate freight charges when ordering. Production Time: From receipt of complete order and approved camera ready artwork, please allow approximate 15 - 20 working days in the plant, unless otherwise noted. Rush orders available, please call for quote. Overruns/ Overruns: We reserve the right to ship and bill 5% over or under the ordered amount on customized merchandise. Click here for 1,000's more great and exciting every day needed top-quality Promotional Products & Custom Printed Stationery, many of them under a dollar. Products for every occasion and promotional event; and many are Made in USA. Order your Custom Imprinted Coffee Mugs NOW and save time and money! To place your order, click here. Then follow the instructions in the ordering form, or call us at the telephone number at the bottom of this page, and place your order by phone. Remember. Customer satisfaction and high quality service to our customers is our main goal. For your convenience, we accept Master card, Visa and American Express credit cards. To e-mail your artwork, purchasing orders, or inquires, click here.